(Long Island, NY) For the second year in a row, Suffolk County hosted a Car Free Day celebration at the H. Lee Dennison Building. The County held a “Mobility in Suffolk Summit” that featured panel discussions on Bus Rapid Transit, bike-share and downtown walkability and development. In addition to the summit, the County will also made food trucks available for lunch to avoid the need for employees and visitors to have to leave the premises. County Executive Steve Bellone addressing Mobility in Transit Summit participants. Photo Credit: Suffolk County. Car Fee Day is an event celebrated in over 1500 cities in 40 countries around the world. It’s celebrated in different ways but with the common goal of taking cars off the road. The benefit to society is a day with less traffic congestion, a greener environment and reduced energy use. Car Free Day encourages the opportunity to consider the negative impact of single occupancy vehicles. Using cars less by using alternative modes such as transit, carpooling, bicycles, walking and telecommuting helps reduce traffic, conserve energy, reduce harmful emissions, reduce parking problems and save money. In Suffolk County this year, 1,173 people pledged to be car free or car light which will account for over 26,000 commuter miles (more than the circumference of the Earth) and 13 tons of carbon emissions saved. 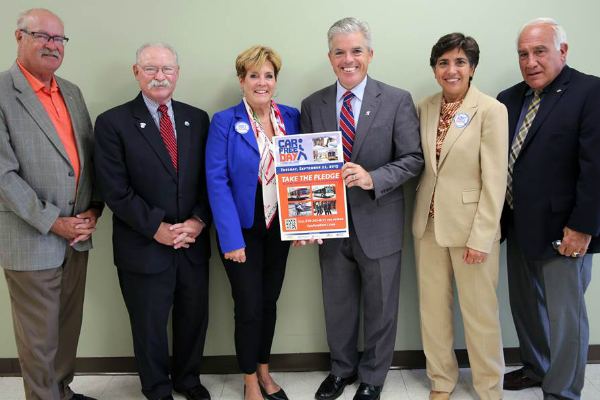 Port Jefferson Trustee, Bruce D’Abramo, Babylon Village Mayor Ralph Scordino, Katie Dunn, 511 NY Rideshare, County Executive Steve Bellone, Rosemary Mascali, Transit Solutions, Patchogue Village Mayor Paul Pontieri. Photo Credit: Suffolk County. 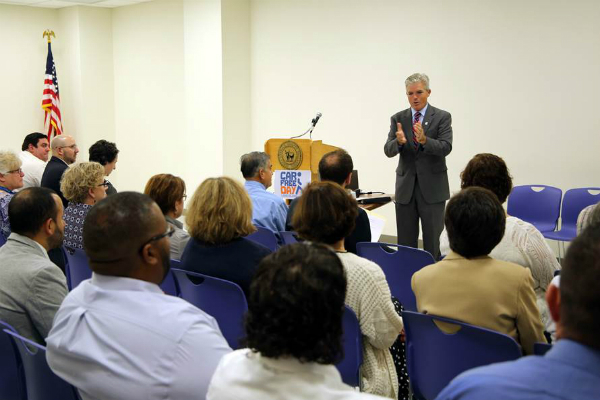 Suffolk County Executive Steve Bellone also announced today that the County will analyze the benefits of offering County employees pre-tax transit benefits. Transit benefits can save employees and the County hundreds of dollars a year on commuting costs and payroll taxes. By encouraging transit ridership, the program will also help reduce roadway congestion, parking challenges and pollution. If adopted, employees will be allowed to set aside up to $130 per month, tax free, for transit or vanpool expenses, saving up to 40% of their commuting expenses. The County can also realize savings in payroll taxes, and attract and retain employees, all at no or little cost to the County.